My Line Is Red: Downtown Silver Spring: Why Won't They Bring Us Home? Why Won't They Bring Us Home? Finally. A break in the DC to Silver Spring cab war has dawned upon us. The December holidays and the first part of January led to a lot of functions and events where I roamed out and about often in DC, and I often found myself needing a cab to get back home. Leaving Downtown Silver Spring is somewhat easy, as one can frequently walk over to the forever-in-progress transit center in front of Kitchen Bar and hop in a cab. Not sure why Sun Cab can't get their ish together and relay the call outs to the cabs. On numerous separate occasions, I've called them, asked for a cab, they say it will take about 15 minutes (I'm situated just 6 blocks away), and then I get a call back that "there are no cabs available at this time." So the last two of those unfortunate times, I've walked to Kitchen Bar (which I normally wouldn't mind in the spring/summer/fall, but there were some inclement weather days), to find a whole string of cabbies just chillin', looking for work. So the most recent time, I finally asked what's up with that. I told the cabbie about how I had called their main line and the cab driver said that unfortunately sometimes that happens, that the main line phones don't connect to them, and they just miss out on business. And here we are trying to support our local drivers. Getting home late night after metro has closed, that's a different story. Why do DC taxis have such an issue bringing passenger to DTSS? It's not like we're in Fairfax, VA. We're literally 10 blocks outside of the city. What gives?! I even asked my last cab to take us to the border of DC and Silver Spring and we'd just walk. He thought twice about that and then changed his mind to NO! And in the event that they change their mind and bring you, it's a rip off cab fare and we're at their mercy. Not sure why this keeps happening. The one solution I've found to this (albeit an expensive one), is Uber. They are drama free, won't complain, and they'll get you home. You can order right from your phone with a touch of a bottom and they charge it on your credit card. They also include the tip on your card, so no cash is exchanged. The price to pay is based on supply and demand. 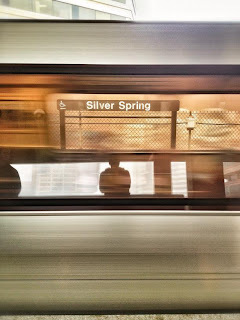 If the demand is high, you could end up paying up as much as $52 (or much higher) from K Street, NW to Downtown Silver Spring but you're guaranteed a ride home. They show up within 10 minutes from when you call them and they drive black sedans. Is it worth it? If it's freezing cold out and you've been rejected by cab after cab and the metro is closed, yeah, it is. Alas, recently Uber has introduced UberTaxi, the same service Uber provides, but this now includes hailing DC cabs through the Uber app and paying the $2 dispatch fee plus the cab fare. As per the nifty email they recently sent out to all their customers, "just like with our black car service, open up your Uber app and you can easily request a DC taxi, pay with your credit card, and do it all with just the tap of a button. In a nutshell, UberTAXI offers the reliability and convenience you expect from Uber at a lower cost, so you can pick exactly what kind of ride you need, whenever you need it." I will assume that this most likely forced joint partnership came from the DC Council, who had issues with Uber earlier this year. Not sure why they had the issues, when DC cabs have the business but REFUSE TO ACCEPT IT! Anyhow, I'll take it, if this guarantees me the ride home and I don't have to pay the inflated price. Also, one should note that you can only pick up UberTaxi from DC. The service isn't available yet from the VA/MD suburbs. Regular Uber, however, will pick you up from Downtown Silver Spring. The Uber application is easy to use and works well for both Taxis and Uber pick up. Silver Spring Metro - Red Line. Honestly - more recently, more than not, metro has just been unreliable on the weekends. With up to 45 minute waits due to construction and single tracking on the weekends, until they shape up and wrap that stuff up, we're just gonna have to deal. However, you can check on wmata's website for arrival times. Most of the time, that's accurate. If you have to be on time to something, I suggest to find a back up plan (that's how I ended up with the cabs a couple of times). Metro Bus. If they are on schedule, Metro Bus might be one of the most feasible ways to get to DC. The Trip Planner will help you know where you need to pick up the bus, what bus to take, and exactly how much. It will estimate the time frame but I would recommend to tack on twenty minutes extra in addition to what they list for you. Cabbie. The taxi cabs park in front of 8407 Ramsey Avenue. On Sun Cab's website you can either book ahead online, text them at 301-605-9222, or call them at 301-252-0575. Zipcar. There are a few locations in DTSS that you can scoop up zipcar: 1200 East-West Highway, 8320 Georgia Avenue, 1701 East-West Hwy. Greyhound Bus. For more information on times and schedules, visit their website. Coming soon: Capital Bikeshare. Proposed location - Second Avenue to Spring Street and that the Second Avenue/Fenwick. If there's anything else I may have missed, please let me know! I'll happily add it to the blog post. Just go ahead and shoot me an email. I'm not sure I understand...you know that cabs can't refuse the fare due to the destination, correct? All you have to do is get into the car and you're golden (so long as you know your rights). Are all these drivers rolling down the window asking where you're going prior to letting you in? I'd just ignore them/wait patiently at the back door for it to be unlocked or say something vague like "a couple miles away" or "northwest" if absolutely forced. Good scoop on Uber Taxi. Didn't know about that. I have had a few times the DC taxis have scowled at driving me home to the area but this should help. Not sure why the DC taxis didn't think of this before. "However, you can check on wmata's website for arrival times. Most of the time, that's accurate." That's exactly what I do on weekends now and I no longer have any problems. The trains arrive within a couple of minutes of the time listed on the WMATA site and I get downtown on time. No big deal. Frankly, I'd rather deal with the inconvenience on weekends and have them upgrade the switches and other equipment than risk another accident. 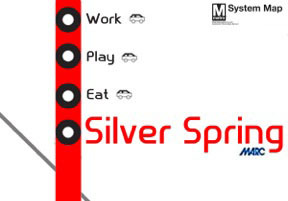 The S2/4/9 (16th st) and 70/71/79 (Georgia Ave/7th) metro bus lines are pretty much the best option for late night DC-Silver Spring trips. Both lines run every 10 minutes into the wee morning hours. DC cab drivers go back from a Silver Spring fare drop-off with no chance to get another fare until they draw parallel to Columbia Heights. This is due to economics. Cab rates have not kept pace with petrol costs. Once in DC, on upper 16th Street, the residents can afford to drive . . . that is the residents who aren't already home and in bed. On upper Georgia Avenue most DC residents cannot afford to hail cabs to get downtown. So, DC cabbies whose fares range from $20 to 30, are understandably reluctant to drive when there is little or no profit in it. We (unfortunately) moved to DC earlier this year and in my opinion one of the few things that makes living here doable is Uber. Cabs hardly ever show up when promised and often don't show up at all. Uber cars ALWAYS show up, the cars are clean, the drivers are courteous, and the cost is pennies more than a regular cab. It's a great business model and everyone I know who uses it loves it. If I enter the destination when I request the ride, do the drivers see the destination before the pickup? If so, should I be worried that drivers may not want to take that trip? Might I get a quicker pickup if I keep the destination secret?